Wolf Journeys are not just for wolves. This episode will take you on a journey you may have never imagined. This episode takes a close look at the often-troubled relationship between humans and wolves. There’s recent history on that topic. If you have a dog as pet, watch this episode with that dog. You’ll be learning about your dog’s ancient ancestor. Man’s best friend? Maybe not, but wolves are the ancestors of your dog. This episode is all about wolves, including OR7. Let’s pay the wolves a visit. View Episode 54 in its entirety ad-free by clicking here. Are you unable to spend a half-hour watching the program. No problem! Watch a segment at at time. Each segment is about 10 minutes in duration. Click here to watch Segment One. Some researchers caution that Content-based ESL can short-change language instruction in favor of academic content. They could use this episode as proof, for there’s no direct instruction – and very little indirect instruction. Nonetheless, I consider this a vital part of this unit on animals. English learners of all ages need an emotional connection to the material with which they’re working. This episode is all about that sense of wonder provided by the unit’s theme. 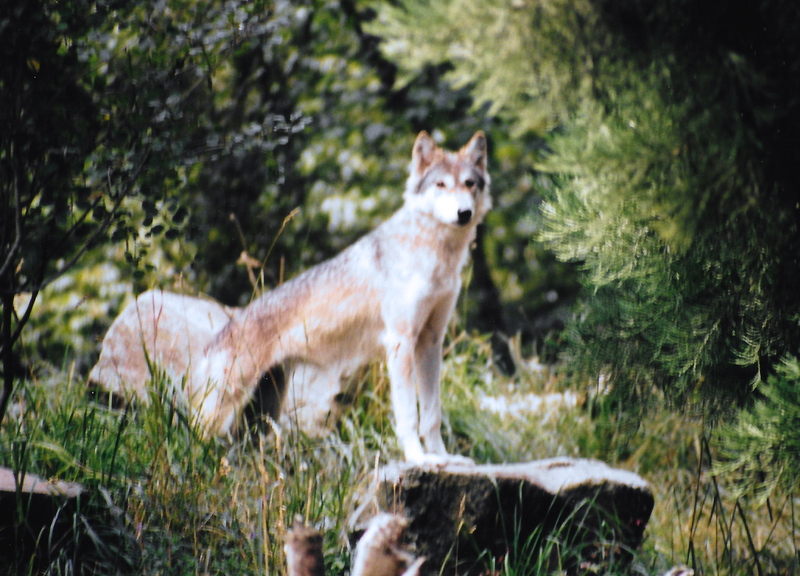 Wolf Journeys is an episode to form connections between English Learners and the content of this unit. In other words, it connect you to the animal world, at least emotionally. If you find that connection missing because of low comprehension, I suggest watching the episode over a few times. A deep connection to content can put you in the fast lane of improving your English. If no magic happens with this episode, take encouragement that it will happen yet on this long, hard road to English Proficiency. Mark this episode for re-watching when your comprehension skills are higher. We see movie trailers and a video about an amazing natural process. Do your best to follow along, but don’t stress. It’s about the wonder of nature! Identify the theme and basic facts reflected in video and literary works on the same subject. Identify emotional content contained in video and literary works. Science: Trace and explain the population dispersal dynamics that are present in wolf populations. Explain the cause/effect relationship between the reintroduction of wolves into Yellowstone park and the ecosystem and geography of the Yellowstone basin. Here’s a link to the full-length production The OR-7 Expedition 1200 Miles to Explore Human and Wolf Coexistence. Click Here. Medford TV Station report: OR-7 finds mate. Click here. While I take great joy in sharing the video I’ve captured over the years, this episode replies almost entirely on the work of others video producers and videographers. Indeed, the only images I contributed were the still photos of timber wolves that I took in the 1980s at the Portland Zoo (now called the Oregon Zoo). The video OR7 The Journey is produced and directed by Clemens Schenk. The website is or7the journey.com. Five much-deserved awards are on the home page. What we enjoyed was the trailer for this movie. It’s over 60 minutes long and can be viewed from their website for a fee. The book Journey: The Most Famous Wolf in the West is published by Little Bigfoot Publisher. It’s written by Emma Bland Smith and illustrated by Robin James. The images used in the review were from this book. The ISBN is 978-1632170651. I highly recommend this book to English Learners. The book Wolf Haven; Santuary and the Future of Wolves in North America is published by Sasquatch books in Seattle. It’s written by Annie Marie Musselman with essay by Brenda Peterson. The ISBN is 978-1632170514. The book is available from a number of outlets. I bought mine in Grants Pass at Oregon Books. If you’re in Portland, get your at Powells – a book institution in the Pacific Northwest. Wolf Haven is a sanctuary for wolves. Only today did I learn of their role in the production of the movie OR7 the Journey. It’s a beautiful book with though-provoking text. The video The Wolf OR Expedition; 1200 Miles to Explore Human and Wolf Coexistence was produced as OR7 Wolf Expedition: Awareness through Adventure. Their website is or7expedition.org. The movie is about an hour and half long. What we enjoyed was the trailer. The website has a Q and A section that’s very interesting. Skyship films produced this fantastic video. The video How Wolves Change Rivers is produced by Sustainable Human. This video highlight the “Trophic Cascade” that occured in Yellowstone National Park after the reintroduction of wolves in 1995. Visit sustainablehuman.tv for the website. Video footage is from Tom Dowser, Sam Price Waldman, Charley Voorhis, Fishing 4, Greater Yellowstone Coalition, Roadtrippers, and Video Blocks. There was no direct instruction in this episode. From time-to-time it’s important to give learners an emotional experience reflecting the wonder of the content. That’s the goal of this episode. We feature some animals in Latin America. Visit the Episode 55 Page.